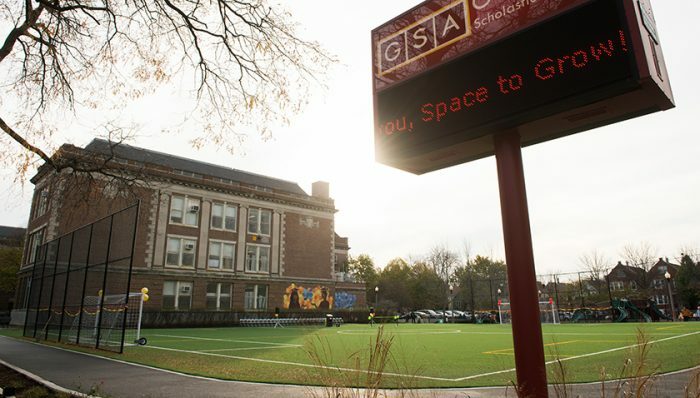 Frank W. Gunsaulus Scholastic Academy’s Space to Grow schoolyard is an engaging and dynamic place for kids to learn and play. The new schoolyard includes a multipurpose turf field, jogging/walking track, native gardens and trees, rain gardens with native plants that collect roof runoff, vegetable gardens, outdoor classroom and seating. The schoolyard works hard to mitigate neighborhood flooding with rain gardens and native plants, a rain storage area underneath the schoolyard to hold water and slowly release it into the sewer system and replacing impermeable surfaces with porous surfaces so the water can through the surface into the storage area below. Three New Space to Grow Schoolyards Are Under Way!